Ann Katharine Swynford Lambton, often known as A.K.S. Lambton, graduated from the SOAS (School of Oriental and African Studies) at London University, and travelled in Persia (now Iran) throughout the 1930s, developing a profound interest in the politics and culture there. She never married. She served as the press attaché to the British Legation in Teheran from 1939 to 1946 and became a leading expert on medieval and early modern Persian history, Persian language, Islamic political theory, land reform in the region, and tribal histories. She was appointed as Reader in Persian at the University of London in 1948, and held the Chair of Persian at the SOAS for 25 years. 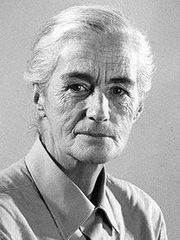 Professor Lambton exercised enormous influence through both her teaching and her publications, such as Three Persian Dialects (1938), Landlord and Peasant in Persia (1953) and The Persian Land Reform (1969). Ann K. S. Lambton is currently considered a "single author." If one or more works are by a distinct, homonymous authors, go ahead and split the author. Ann K. S. Lambton is composed of 7 names. You can examine and separate out names.